Can Solar FIT in Alberta? The following article was submitted to the Climate Change Advisory Panel on 8th September 2015. 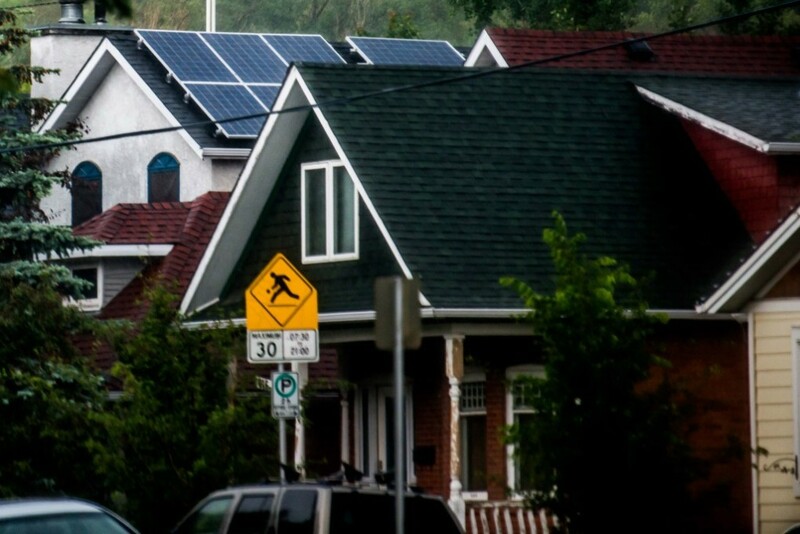 It tries to put together a comprehensive plan for incenting Albertan homeowners, businesses and farms to invest in a grid-tied solar power system through both a feed-in-tariff program and a cash rebate. The Pembina Institute in their report Power to Change provided a plan to reduce ghg emissions from the power sector, by expediting the retirement of Alberta’s coal fired power plants and converting its two youngest to burn biomass, working on energy efficiency and of course developing our renewables capacities. Below I will try to describe a solar incentive that can accelerate Alberta’s solar microgeneration capacity to 200MW by 2020, and facilitate Pembina’s target of 3,000MW by 2033. Solar’s capacity has been doubling every year for the past three years. There are currently about 1,200 solar power systems connected to the grid with a total capacity of 8,069 kW , which is still less than 0.5% of Pembina’s 2033 target. Although solar has a competitive levelized cost of energy (cost of generating one unit of energy over a system’s lifetime), solar microgenerators are best looking at a 15 year payback. The two financial challenges with going solar – namely its upfront costs and the market’s price uncertainty – are going to be tackled in this incentive. The proposed incentive will reduce payback of a Mini Micro-Generation Unit (Mini MGGUs have capacities less than 10kW, which is enough to offset annual consumption of most homes and small shops) to well less than ten years. The microgenerator is to recover half the installation cost through an energy rebate incentive to be part of other efficiency rebates, the other half will be rewarded by export credits in their power bills over 10 years. The microgenerator is also saving on consuming energy on-site so their payback is actually going to be less than 10 years. After the contract expires they receive retail cost of energy exported to the grid as they do today. What are the current and expected future cost of going solar? What is the FIT rate going to be? As with Ontario’s microFIT program, which started out at a very generous $0.8/kWh and is now at $0.384/kWh, rates will decrease as new supply chains enter the market, solar providers become more competitive and global module and inverter costs continue to fall. As mentioned above, the FIT rate will be designed to reward microgenerators half the installation cost over 10 years. If we take a starting installation rate of $3.5/W then we need a FIT rate of $0.32/kWh. What’s the cost to incent 3GW of solar? If we are going to apply the same rate of incentive (ie. payback within less than years), we can expect that larger MGGUs (capacities between 150 kW and 1,000 kW) would cost less to sign up because they will have lower installed costs. If we assume that the average cost per watt spent on microgenerators is $2.5/W then the total payments for incenting 3 GW of solar would be $7.5B. These 3GW of solar will produce 3,300GWh per year, half of which will (supposedly) be exported to the grid, and which at a pool price of $70/MWh will yield $81M per year towards the program, reducing the total cost to $6.7B. How is it different from Ontario’s microFIT program? The Ontario microFIT program rewards microgenerators for the energy their systems generate through a unique meter connected directly to the system. In Alberta the MGGU is connected to a load first (a home, building etc. ), which is connected to the utility by a single bidirectional meter that measures energy imported and exported from site. By keeping this setting, solar microgenerators are persuaded to reduce their daytime energy consumption when the sun is shining – and when energy is in its highest demand – in order to maximize their energy exports and return on investment. How does this cost compare to the cost of paying members of microFIT program? The microFIT program pays credits not for energy exported from site, but rather on the total amount of energy generated. The average payment for a new microFIT contract over 20 years is $7.68/W, more than double this proposed incentive. What would be the cost per kWh to power consumers? The incentive can be funded through a regulated surcharge on consumers’ power bills. $6.7B spread over 10 years and an annual supply of 50,000 GWh per year works out to a spread of $0.0134/ kWh. takes advantage of viable roof space. Energy is produced right where it is needed..
homeowners and businesses will focus on energy efficiency and reducing their daytime energy consumption (something that rebates or the microFIT program can’t incent for). because these capacities are going to be distributed their effect will essentially be a reduction on the load side, they do not contribute to transmission power losses (nor do they require any transmission upgrades of course). Moustafa is the owner and principal of Neighbour Power Inc.
Is Solar Subsidizing the Alberta Grid? Progressive governments that are serious about renewable energy and climate change subsidize solar in order to make investments in it more rewarding. With oil prices threatening the province’s books there is no sense in asking for such incentives, but what if I told you that we can accelerate the adoption of solar power in our province without any cost to the taxpayer? Alberta has a world class solar potential but unfortunately solar micro-generators are not receiving fair market value for clean energy their systems supply to the electricity grid. Instead solar energy is traded at a discount and is effectively subsidizing electricity from coal and gas plants. 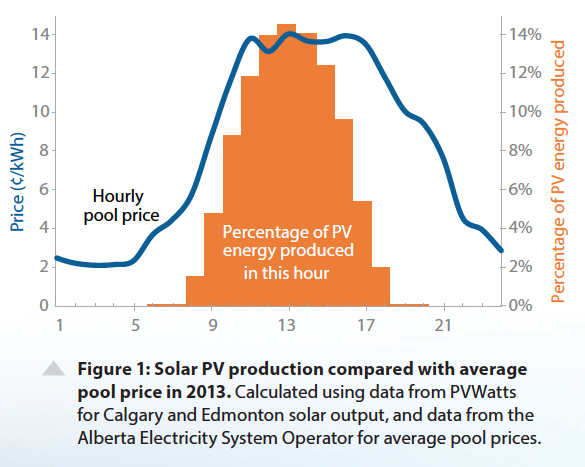 How is solar subsidizing the Alberta grid? Solar power is already in exponential growth in Alberta. There are over 1,000 solar power systems connected to the electricity grid and almost half of them were installed in the past couple of years. Solar power was mainly sought by environmentally inclined customers but the motivation is shifting more towards economics. Without any rebate incentive solar power systems on a good roof in Alberta will generate energy at a lower rate than what utilities are charging, and will continue to become more rewarding as the cost difference between escalating cost of grid energy and transmission on the one hand, and declining cost of photovoltaic equipment and improvements in cell efficiencies on the other. The simplest and most cost effective way to go solar is with a grid-tied system. This is a system that allows you to use solar power when it is available during the day and grid power when it isn’t. When there is no one home excess electricity that is not consumed is not stored in batteries to be used later; rather it is exported to the grid to be used by your neighbours’ appliances. The Alberta Micro-Generation Regulation mandated that micro-generators of renewable energy receive “fair market value” for their exported energy. What this has come to be understood was the monthly retail rate. So for example, if in January you were charged eight cents for every kilowatt-hour (kWh) of electrical energy consumed, your retailer will compensate you eight cents for every kWh exported to the grid. Sound fair? Actually, it’s not. Electricity in Alberta’s deregulated energy market is traded on an hourly basis. Electricity pool prices peak with consumption which happens during the day, and at night it troughs when demand drops. Solar power’s generation pattern happens to compliment the electricity consumption/price pattern. It is available precisely when the price of electricity is at a premium. So isn’t it fair that solar micro-generators are compensated by a premium rate? That’s exactly what the Light Up Alberta program did. It was a program brilliantly designed to take advantage of our deregulated electricity market with several participating retailers across our province offering to purchase exported solar energy at 15 cents per kWh. The program was effectively terminated after complaints that it was a subsidy. The Light Up Alberta program is (or was) the easiest way to accelerate the adoption of solar in our province. It is a voluntary feed-in-tariff program that – as opposed to Ontario’s very generous program – doesn’t involve millions of dollars in government spending. By trading at their respective pool prices solar micro-generators could be looking at retrieving the cost of their systems in 10 years less. The most promising thing about it as explained above is that this all possible with virtually no cost to the taxpayer. Retailers buy our energy at 15 cents per kWh which is what the market values it to be. What is currently happening is that solar micro-generators sell their energy at a significant discount, which then goes over to their neighbours who are charged the same distribution and transmission rates when the energy they used just came from next door. So not only is solar making power cheaper for everybody, it is effectively subsidizing our electricity distribution and transmission systems as well. With natural gas prices being at historic lows, and with the government continuing to delay releasing its climate change framework it is time to strike when the iron is hot and demand the bare minimum, and compensate solar micro-generators fairly. Many customers that consult with us have a dream of living in an off-grid home powered by solar. Of ridding themselves of the utility meter, and paying no more bills. This dream is easier than ever for homeowners to achieve since solar and electrical energy storage systems are now more accessible and affordable than they ever have been. But is going off the grid the key to a sustainable energy future where neighbours live independently from one another? Of course if you live in an area where running a power line to the local utility grid is prohibitively expensive then you have no choice but to setup an off-grid system. But is it practical to demand that every building meets its own energy requirements? In this post we will discuss the advantages of grid-tied solar and try to describe how a sustainable energy system might look like. A grid-tied solar power system is one that is either directly or indirectly connected to the electricity grid. Grid-tied systems makes up 87% of the total Canadian solar market. 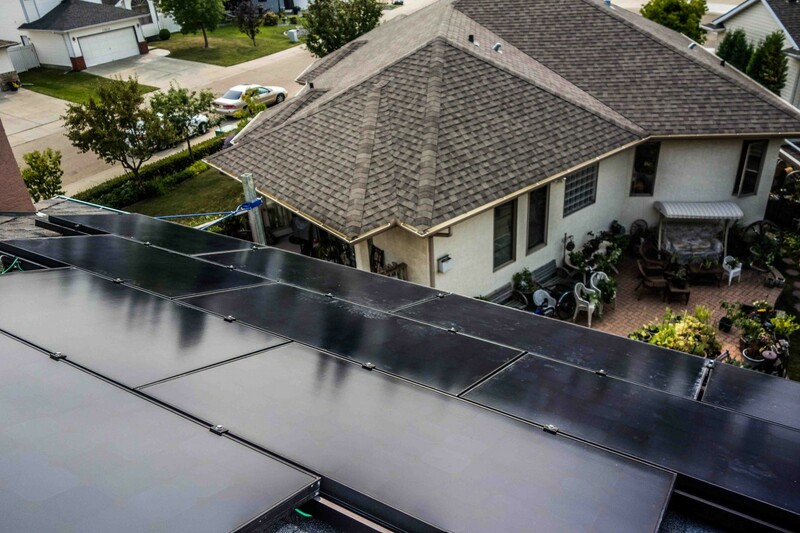 In Alberta a solar micro-generation system is connected to a building’s appliances, powering them first and exporting any excess to the local electricity grid, earning the micro-generator a credit on their bill. An off-grid system can easily cost double the same size grid-tied system because of the added cost of the batteries. A grid-tied system is more flexible from day-to-day use, as well as in accommodating for seasonal variation. It can be of any size because the building’s appliances are still going to be connected to the grid and so will be able to draw power from it whenever solar power is in short of supply. The size of the system can be customized to suit a home’s available roof space and aesthetics and the owner’s budget and expectations. A grid-tied system exports any excess energy produced to the grid to do useful work elsewhere. 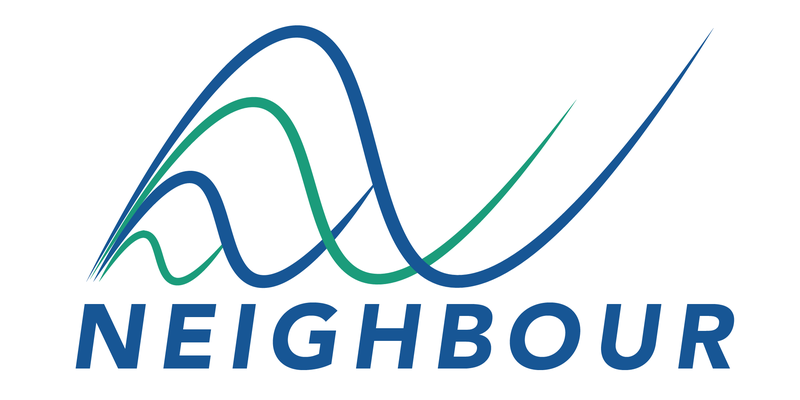 This energy is transmitted to the local distribution system to do useful work on other appliances in the neighbourhood. On the other hand an off-grid system produces excess energy to be stored for when it isn’t available. The system has to meet the building’s power and energy requirements, meaning it has to deliver power even during the dimmest, snowiest time of the year. During the summer, the system languishes because it is so oversized; all that excess energy goes to waste because it has nowhere else to go. Furthermore, any mistakes like leaving the lights turned on could have a detrimental impact on the reserve of energy as well as the lifetime of the batteries. Tier 1 solar modules (commonly referred to as solar panels) are warrantied for up to 25 years. Together with inverters, they are proven to be a reliable and long-lasting technology. Adding batteries to the system will only reduce its efficiency, and most will require routine check ups and can be hazardous if not maintained properly. It might be easy to discount from the importance of the electrical grid as it quietly transmits power across our heads and below our feet. According to the National Academy of Engineering it’s not the internet or the airplane but the electrical grid that is the greatest engineering achievement of the 20th century. What we need is not to disconnect from the grid, but rather to decentralize and diversify its resources. Essentially both concepts do the same thing – they bring energy closer to where it is needed. But rather than just making one building self-sufficient why not make whole communities self-sufficient? Solar and wind are non-dispatchable sources of power, meaning they provide power only when their resource becomes available. A dispatchable source is one that provides energy on demand like biomass and hydro, and of course storage technologies including batteries. The role of the grid will remain pertinent, and there lies a place for batteries within it, but not in making one home or building sustainable but in supporting the operation and reliability of the local power grid. The electricity system was designed based on generation sources that were typically far from where electricity is needed, and therefore needed to be shipped long distances to consumers. The system is centralized in the sense that electricity flows from centres of generation to centres of consumption. 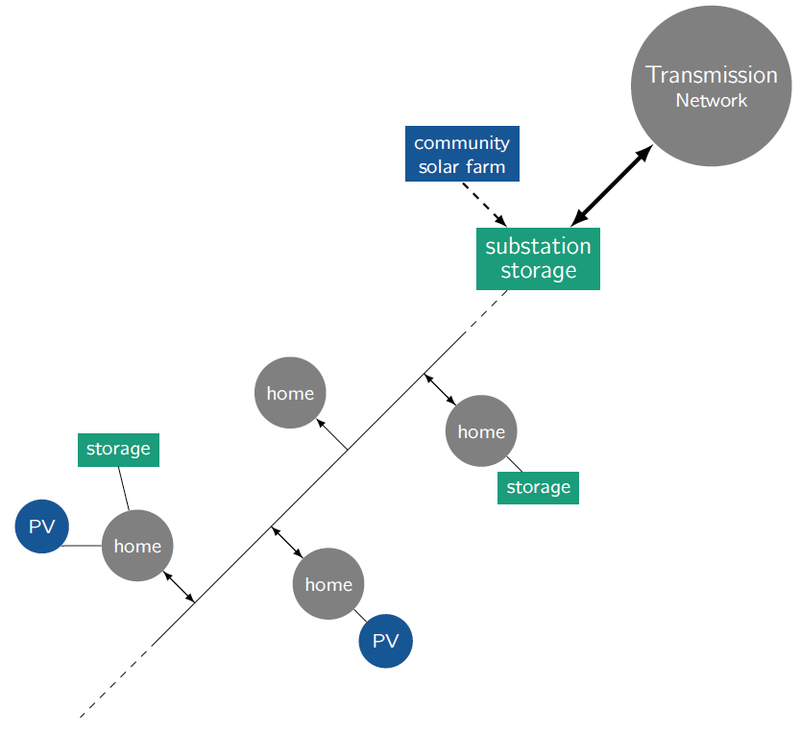 As you can see below, a decentralized energy system can be made up of renewable generation and storage sources distributed where they are needed, and of course would still require an electrical distribution system to connect these assets together. A neighbourhood that utilizes distributed solar generation and storage relies less on generation systems that are further away. Not all of the homes need to be equipped with solar and/or storage technologies. It is much more economical, practical for community members to share their energy resources rather than to live independently from one another. The key to a renewable and sustainable energy future means integrating a variety of renewable energy systems that are specifically designed to meet the needs of a particular community, and for that there is certainly room for storage.